CP Foods (UK) Limited is the UK division of the worldwide CPF Group, a world class food producer dedicated to creating real food that is tailor-made to the requirements of their customers. As part of CPF Group, CP Foods (UK) Ltd is responsible for production facilities in the UK where imported produce is prepared, packaged and delivered to UK customers. John Vincent, Financial Director, CP Foods, wanted to investigate effective procurement but felt the company didn’t have the internal resource or expertise. 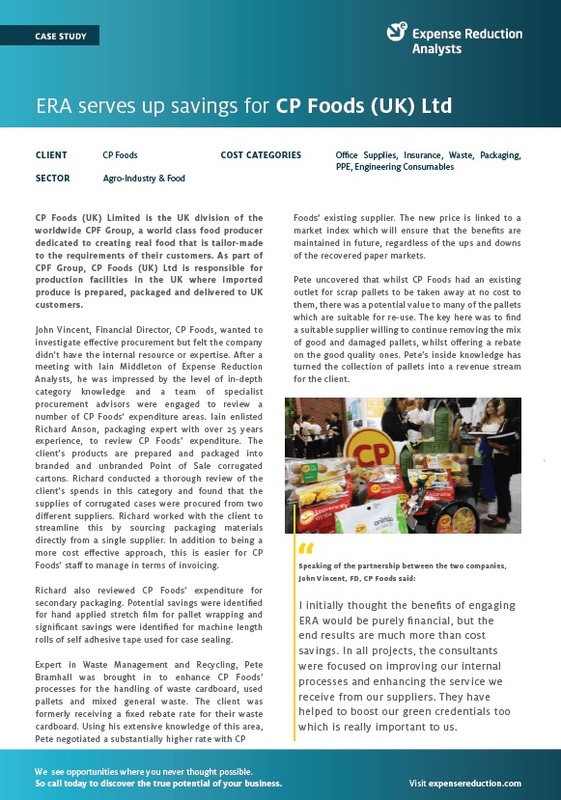 After a meeting with Iain Middleton of Expense Reduction Analysts, he was impressed by the level of in-depth category knowledge and a team of specialist procurement advisors were engaged to review a number of CP Foods’ expenditure areas. To find out more about how ERA helped Country Park Foods, including results, savings and more details from the client, download the full case study now.